My Grandfather - Lift Engineer and Electrician. My Grandfather – Lift Engineer and Electrician. My grandfather worked for a company based in Calvin Street, Shoreditch, East London. He spent most of his working life as a lift engineer / electrician in London. Pre and post WW2. 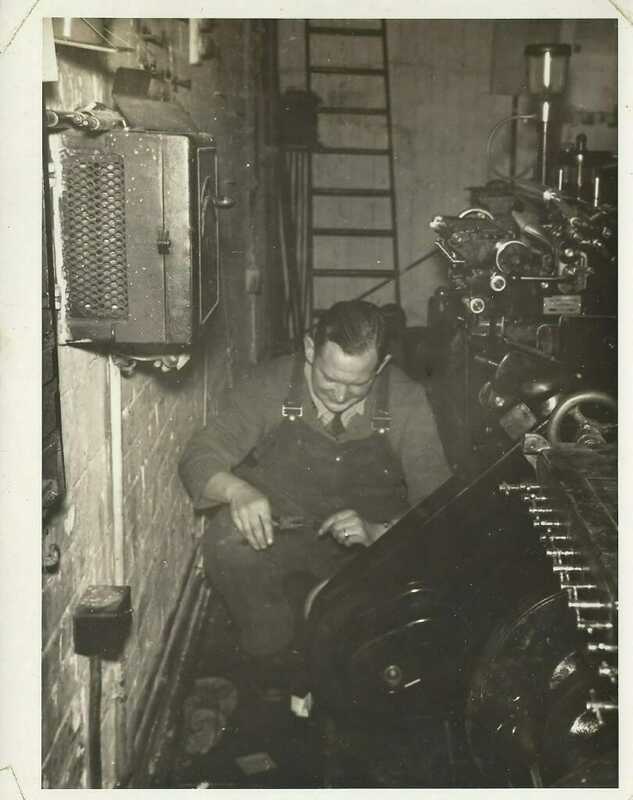 Here he is in action, working on machinery that must now be very very old! I grew up in Bethnal Green, i was working as an electrician in the local area but not that long ago. The area has changed so much now. I love the old pictures that looks like a really old piece of machinery. Hello and thank you so much for getting in touch. I always remember my grandfather telling me about the print presses and the breweries, oh and Drings sausages! He was a great influence on me and at age 16 I left school and went on to be a mechanical aircraft engineer with British Airways for 21 years. Even to this day I still have a healthy interest in all things electro-mechanical. Frank passed away in 2007 in Leigh-on-Sea aged 91. He retired to Essex around 1981. Sadly I don’t think I have any more photos of Frank at work, plenty of him and the family of course! How interesting Malcolm and nice to see a photo. My Step Father was also a Life Engineer working in London. Not sure which part – I know during his early working years he worked in some very posh shops in the West End. His apprenticeship was with Otis. He went on to work for Kone Marryat and Scott and then later Tyssens before retiring. It didn’t however restore my faith in lifts though and I always use the stairs! My biggest regret is not talking to my Grandfather more when he was still alive, about what life was like. He was born in 1916 and saw some great changes in East London. Just wish he had been someone who took photos at work but of course people didn’t really back then. Thanks for reading the blog, best wishes.